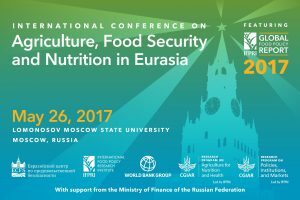 The International Conference on Agriculture, Food Security, and Nutrition in Eurasia featuring the 2017 Global Food Policy Report will take place at Lomonosov Moscow State University (MSU), Economics Department, on May 26, 2017. 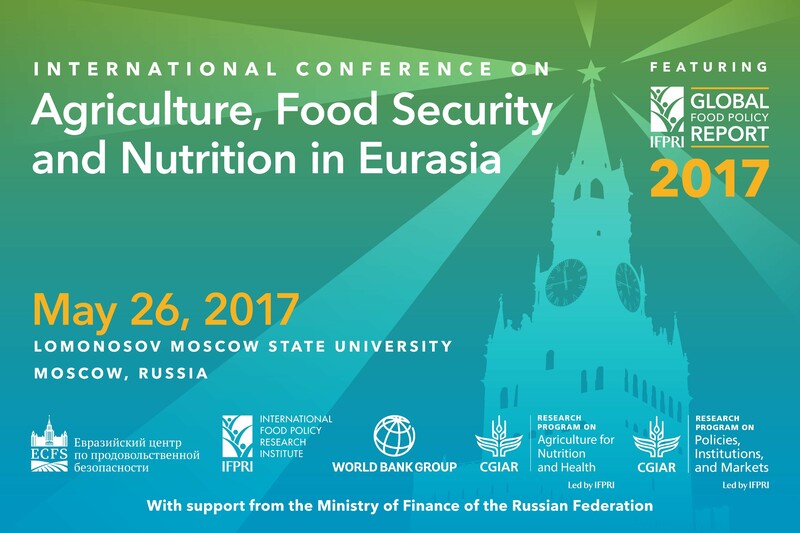 The conference is organized by the MSU’s Eurasian Center for Food Security (ECFS), the International Food Policy Research Institute (IFPRI), the World Bank, and two IFPRI-led CGIAR research programs: Agriculture for Nutrition and Health (A4NH) and Policies, Institutions, and Markets (PIM). Financial support for the conference is provided by the Ministry of Finance of the Russian Federation. Dr. Shenggen Fan, Director General of the International Food Policy Research Institute, will present the 2017 Global Food Policy Report. IFPRI’s flagship report reviews the major food policy issues, developments, and decisions of 2016, and highlights challenges and opportunities for 2017 at the global and regional levels. This year’s report looks at the impact of rapid urban growth on food security and nutrition, and considers how food systems can be reshaped to benefit both urban and rural populations. In his presentation, Dr. Fan will focus on key highlights and reflections from the report relevant for the CIS countries. Ms. Eugenia Serova, Director of the FAO Liaison Office with the Russian Federation and Dr. Vasiliy Uzun, professor at the Russian Presidential Academy of National Economy and Public Administration (RANEPA) are invited as discussants for the session. Russian translations of the report’s summary and the chapter about Central Asia will be freely available at the event. Please see the current agenda in English and Russian. If you’d like to participate in the conference, please register here before May 22. Note: Participation is free for all registered applicants but you’ll need to pay for your travel and accommodation unless you have been invited by one of the organizers. A4NH and PIM support IFPRI's Central Asia Research and Capacity Strengthening Program that works in close collaboration with the ECFS and other partners in the Eurasian region. The Central Asia Program is part of the PIM’s research portfolio under the topic of Economywide Factors Affecting Agricultural Growth and Rural Transformation.